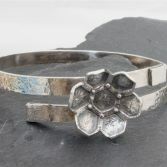 Pretty Honeycomb Flower Bangle has been handcrafted from solid sterling silver in the workshop by me. 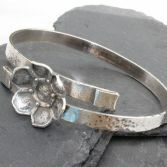 The Bangle has a slight oval shape and has an organic textured finish which has been oxidised to highlight the textures. 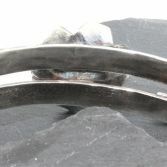 The size of the Bangle would a fit a medium to large wrist and measures 6.8cm in diameter at its wides point. 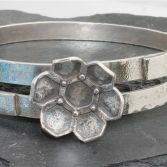 The bangles band measures 6mm in width the rustic flower measures approx 24mm across and stands roughly 6mm proud of the band where the hexagon petals turn up. I have only made one of these bangles. 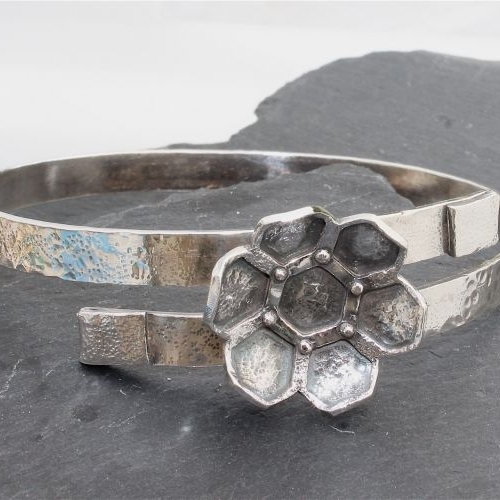 This Honeycomb Flower Bangle has full UK hallmarks stamped at the Edinburgh Assay Office, all my sterling silver is sourced from a reputable UK bullion dealer. 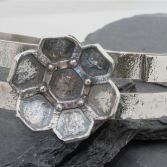 Your Honeycomb Flower Bangle will be presented in one of my signature gift boxes and posted via Royal Mail 1st Class delivery (signed for) to any UK address free of charge.